Home » bhutan » 10 reasons why you should go on a road-trip to Bhutan! Bhutan, the land of the Thunder Dragon, the only carbon negative country in the world, the Himalayan beauty offers bountiful reasons for a road-trip! Be it for a nature enthusiast, adventure seeker, photography aficionado, a writer, a foodie or a culture vulture, Bhutan has something for everyone, and more. The uber smiling Bhutanese folks are the epitome of patience, also evident in the fact that Bhutan has just one traffic signal in the entire country! Oh, yes! The drive that begins from Phuentsholing itself towards Thimphu, Paro and beyond is all on the curvy mountain roads where Himalayan beauty unfolds at each turn. The giant waterfalls which come along the way make for beautiful pit stops. In summers, winter or rains, one can see different games the clouds, sun and mountains play, enchanting enough for the traveller in you to just sit down and gaze in wonder. 2. Find your happy place! Bhutan recognizes the importance of Happiness, so much so that the Bhutanese Prime Minister proposed to the United Nations in 2011 a World Happiness Day, bringing a worldwide spotlight on Happiness as a metric. Now, 20th March is celebrated as World Happiness Day all over the world! You’d find people hanging about, playing carrom board and what not, inculcating healthy habits into their lifestyle and enjoying life. One can make friends with them, understand them better, and get inspired to moving towards a happy life ourselves – we have one life after all, why not make it a happy one?! 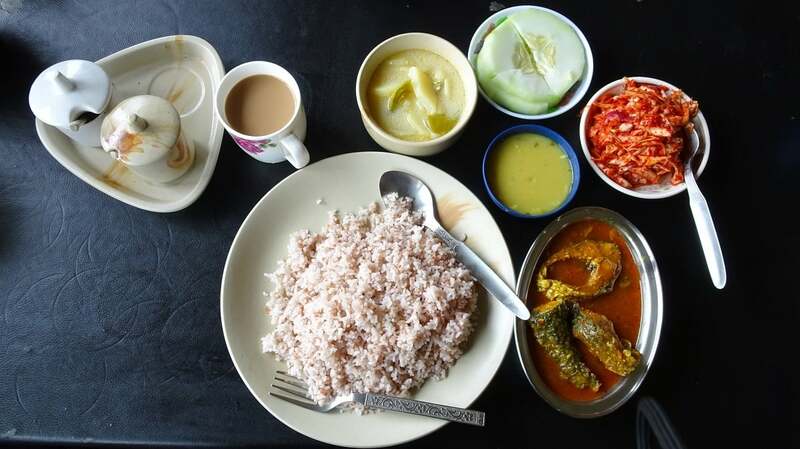 I have been to Bhutan twice and have always looked forward to visiting Bhutan, for the delectable food options it offers. Starting from their National Dish – Ema Datshi which is the stow made from Chilli peppers and Cheese, to Kewa Datshi, the local fish – their food is sumptuous and yummy! Oh and interestingly, they have also got a good grasp on our Indian stuffed paranthas and Gol Gappe. Paro serves some great pizzas and Thimphu offers some delicious momos. Oh, and another great part, the food at many places comes with a splendid view! Sone pe suhaaga, you say?! Ever seen the picture of that monastery hanging about a cliff, and wondered where is it from? 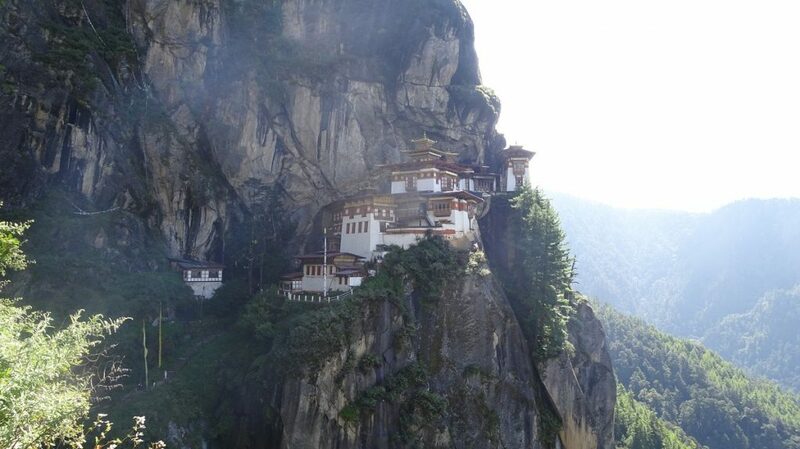 Well, that’s Tiger’s Nest Monastery, or Paro Taktsang, in Bhutan! It is a sight to be seen to be believed. Dating as far back as 1692 and located at 10,000ft, this monastery is reached after a trek the round trip of which lasts almost an entire day. But it’s totally worth it! Interestingly, the site is the place where Guru Padmasambhava is said to have meditated when he brought Buddhism to Bhutan. For the adventure enthusiast in you, this is a good trek to get close to nature and check your fitness when you see the little Buddhist children monks running up and down the hill! 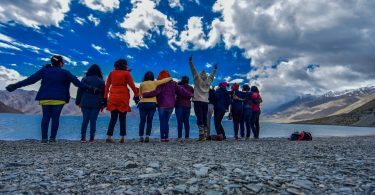 Ditch your phones, for it’s time to romance with the Himalayas! Savour the natural vistas, sit by the riverside, meditate, and just take in all the Himalayan love. If you are looking for a good place for some digital detox, this is it! Finish reading your book, listen to your favourite music and enjoy doing nothing, yet everything, in the Bhutanese lands. Revel in the celebrations of the local festivals here – the grandeur of the festivals here is to be seen. In masks and colourful attires, performers narrate the tales from their mythology. Such is the attraction of these festivals that the locals adorn their national dresses and arrive in large numbers. It is no surprise to see the Bhutanese King and the royal family themselves to be seated in the audience to watch the grand spectacle. 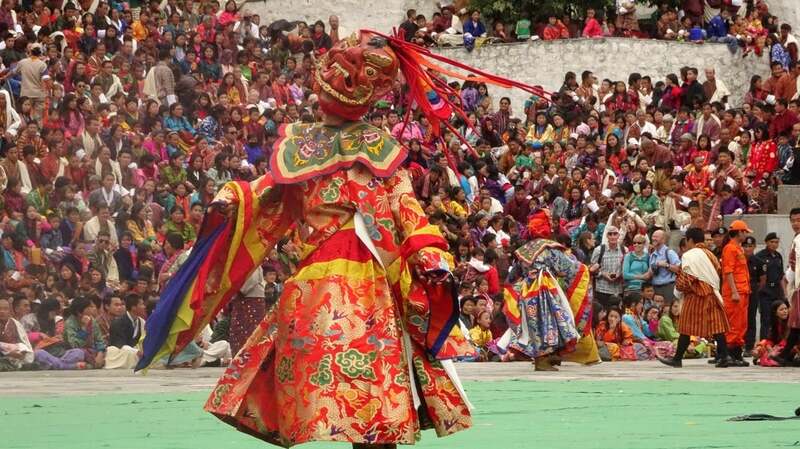 The two major festivals of Bhutan – Thimphu Tshechu and Paro Tshechu, now attract tourists from all over the world. 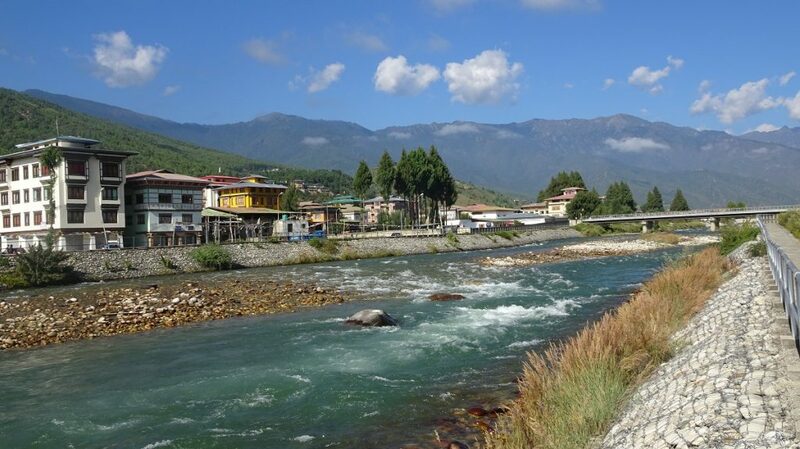 Bhutan has pretty little towns, most of them located by the rivers. To take a walk by the riverside in any of these towns, with mountains in the backdrop, and bountiful of flowers and vegetations and spices is a very lovely experience. I suggest you rise early one of the days to go walking in these towns to see the rising Sun, to listen to the river, to see the towns slowly come to life! Bhutan is home to many picturesque monasteries – the one in Punakha needs special mention for its location on the river bank, formed after the confluence of the Po Chu and Mo Chu rivers – the male and female rivers. 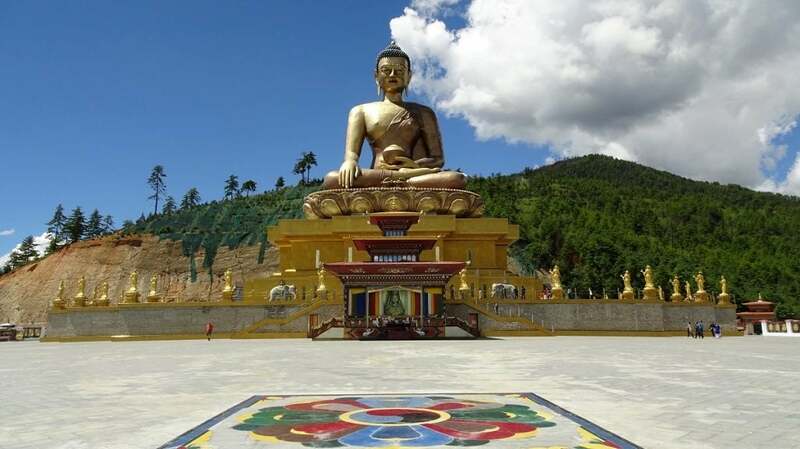 Among other major viewpoints, there is the giant Buddha Dordenma statue, which is visible even from Thimphu Town. The statue is lit by the spotlights and if you try spotting it from the Thimphu town, you can see its shadow being cast in the sky, which is quite an interesting experience. If you love the high mountain passes, the curvalicious roads, Bhutan has some adventurous stretches to offer. 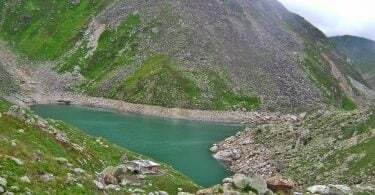 The highest pass in the country is Chelela Pass located at an altitude of 13,08 4ft. The views from up there are spectacular – prayer flags flutter with the strong winds while the valleys stretching down below give an interesting perspective. On the journey from Thimphu to Punakha, one crosses through the Dochula Pass at an altitude of 10,200 ft which remains snow laden in the winters. A drive through these passes gazing outside the vehicle definitely brings to life many scenes from our Bollywood flicks – an experience not to be missed! For us Indians, Bhutan is easily accessible by road and one can do the overland border crossing to get into or out of the country. Being our friendly neighbour, we also get the special privilege of Visa on Arrival, which is great relief even for the impromptu plans. Our Indian currency is welcomed in almost all of Bhutan, so hasslefree process there also. With such preferential and welcoming treatment, one simply cannot refuse the temptation to visit this Himalayan paradise. 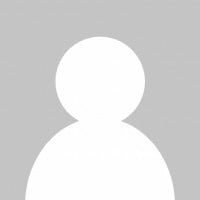 Besides these, there are many more reasons in our book, like engaging in Archery, experiencing the stone spa, exploring the nightlife, making new friends on a group trip etc. but we would now like to know your reasons for a road-trip in Bhutan. Have you been there? What did you love about this happy country?